The harbor city of Valparaíso, a UNESCO world heritage site known for its colorful hillside houses and charming seaside views, is nicknamed "The Jewel of the Pacific." I first met K on a Thursday night at a German bar called Elkika Ilmenau on Diego de Velasquez Street in Santiago’s Providencia commune. He had just arrived from Hamburg; it was his first time in Chile. He wore a plain black shirt, blue denim jeans, a pair of blue Puma racers. These matched his blue grey eyes, which were big and round and cheerful and shaped like perfect marbles. He had a five o’clock shadow that verged on being a beard, and around his neck was a silver rosary with beads the size of pinheads. He smiled with the sort of mellowness that probably comes with being middle-aged. “Welcome to Chile,” I said, even though I was hardly qualified to give a reception; I was set to return to Manila in two weeks. K was not bothered. We raised our glasses of Kunstmann and began to talk, the way two unrelated foreigners in a bar would—talked, smoked, and drank, while pretending occasionally to care about the football match on a flat panel TV mounted on one of the walls of the increasingly rowdy room. Boat tours that pass alongside container ships, cargo vessels, and sea lions are available at the colorful port of Valparaíso. K works for an international clothing retailer, and his job requires him to spend months at a time setting up import departments in foreign cities. “Once you’re in logistics,” he said, “you’re in logistics for the rest of your life.” Early last year, he was in Kuala Lumpur. I told him he ought to have visited my country. “You were so close,” I said. “Have you ever tried San Miguel?” He had, and expressed surprise when I—suddenly proud and responsible for the popularity of Pale Pilsen—told him that the brand originated not in Spain, where he had first encountered it, but in the Philippines. We stayed at Elkika Ilmenau for at least a couple of hours, long after the match was over. When it was time for me to go, K walked me to Avenida 11 de Septiembre, where I took the taxi to my apartment in Barrio Bellavista. He smiled and waved goodbye and before the car made a turn I watched him walk back toward Diego de Velasquez. That weekend K and I met early in the morning and decided to go to Viña del Mar, a coastal city about a hundred kilometers northwest of Santiago. We drove up in a rental Chevy along Ruta 68, a long, winding highway that, once we reached Casablanca Valley, teasingly branched out to acres and acres of winery. 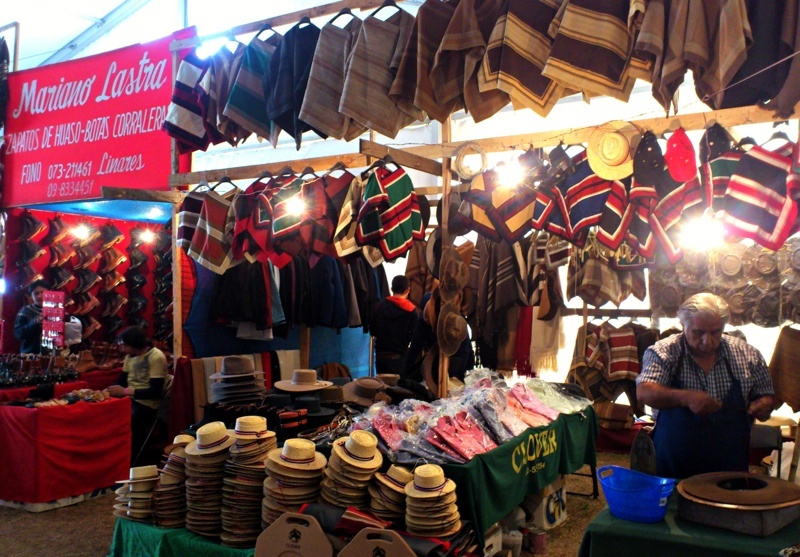 A stallholder crafts traditional Chilean sombreros by hand during Chilenidad Week in Parque Padre Hurtado. Viña del Mar literally means “Vineyard by the Sea”; it is also known as Chile’s “Garden City”—fondly, la ciudad jardín. It is quieter and gentler than the ramshackle charm of neighboring Valparaíso. I did not tell K, but it felt to me like we had somehow ended up in the Philippines. Viña’s greyish blue waters, its long stretches of white sand, those steady rocks that lined the coast and tamed the anxious tides of the Pacific: these reminded me of my country’s blessed islands, of home. The reminder could not have come at a better time. I’d been feeling adrift during my time in Chile—not unhappy, but adrift. It was my first time outside Asia. I had flown in during winter and gotten struck by the violence of the cold. I worked as hard as I could, but spent less than one-tenth the energy to make friends outside the office. Countless times my sorry Spanish faltered and I was rendered mute by my inability to speak and understand the people’s language. But it wasn’t like I tried; I didn’t, which was a mistake. The isolation warped my sense of freedom, which disastrously I began to abuse. I realized, not without alarm, that on most days I was spending more on alcohol and other vices than on food. Staggering one night from one bar to another I almost ran into trouble with neo-Nazis, and a week before meeting K, the day after Thanksgiving, I somehow ended up with a random group of strangers in a shady hostel bar in Plaza Brasil, chugging port from a bottle and snorting a couple of lines. 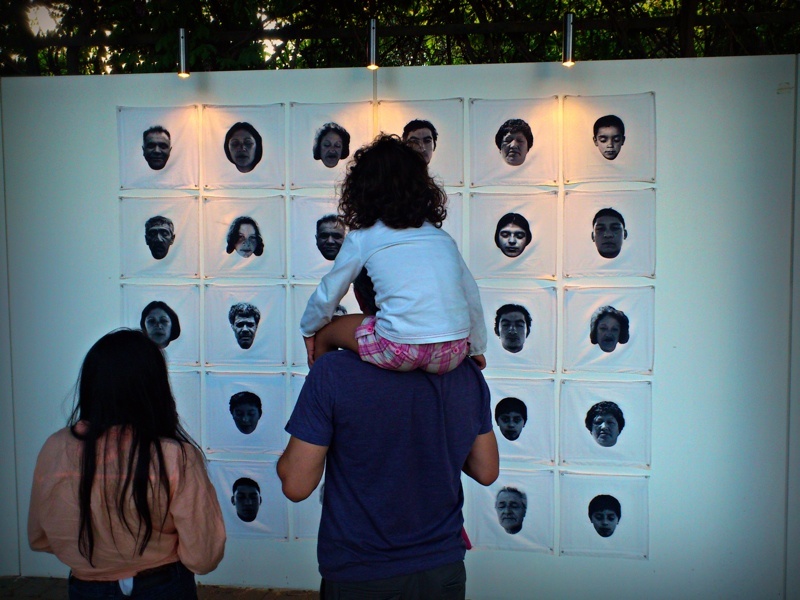 A father and his daughters view one of the installations at a mixed-media art fair in Parque Araucano, Santiago. After lunch we went to Bonafide, an alfresco café on the palm-lined oceanfront promenade, along which old couples ambled, children bicycled, lovers kissed. From there we could see Castillo Wulff, a granite German castle nestled on a rocky cliff in a way that made it seemingly hang over the sea. Above the castle pelicans flew, or they glided just above the surface of the water. We stayed at the café for a little while then walked to the parking lot and drove back to Santiago before sunset. My last week in Chile I saw K every day. On these days I did not feel adrift. We returned several times to Elkika Ilmenau and washed the famous Chilean completos down with Coronas. He gave me Rilke’s Letters to a Young Poet, and I got him a bear-print pulsera (bracelet) that matched his right arm tattoo. We toured downtown Santiago by foot, took pictures of kids playing boisterously in the water fountain at the center of Plaza de Armas, shopped for copper and lapis lazuli souvenirs on Bandera Street, and watched a car racing event around La Moneda Palace, upon which, almost forty years ago, Augusto Pinochet advanced to stage a coup against Salvador Allende. 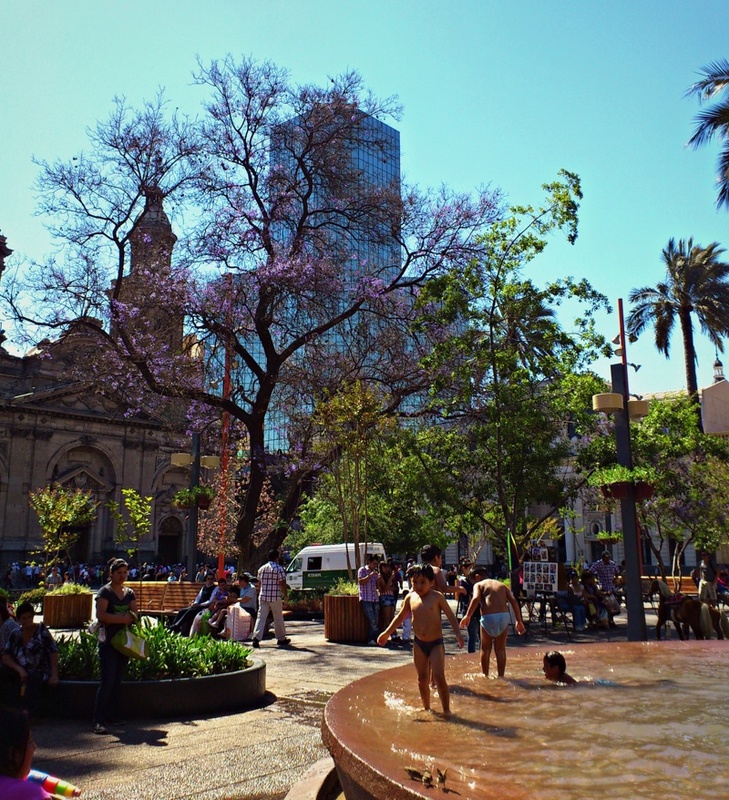 At the center of Plaza de Armas in downtown Santiago, children play in a water fountain dedicated to Simón Bolívar. I even cooked a Thai meal in his kitchen using ingredients that we bought from Jumbo supermarket at Costanera Center. Then we took the metro to Manquehue station and walked into an art fair at Parque Araucano, accepting business cards, catalogs, and brochures from young Chilean artists as enthusiastically as if we were dealers. At a nearby mall called Parque Arauco we ordered two massive cups of strawberry and chocolate ice cream, which we did not come close to finishing. I introduced him to ceviche, the South American version of kilawin, at a Peruvian restaurant called Pachakama on Cirujano Guzmán Street, and he gave me a Cuban cigar to smoke while we drank caipirinhas at Vox Populi, a cozy bar in the bohemian Recoleta commune. One evening after dinner he gave me his silver rosary, which he told me he’d bought in SoHo, New York. Initially I refused to accept it, but he insisted and put it on me himself. On my last weekend, we assembled the tree in his apartment—his Weihnachtsbaum—and talked about how we would spend Christmas Day: he with his husband, I with my family. I told him I was going to be fine. It was going to be difficult to say goodbye—this was one of the great dangers of attachment—but I came to understand that in life you take two weeks for what it is: a sliver of time and place, no more and no less. After it all, you learn not to pine and you learn not to regret. You learn to keep certain effusions of the heart to yourself, and to decide against saying things like “I knew it the moment I met you,” no matter how tempting, no matter how true. Sometimes you simply don’t let the other know. Besides, there is no guarantee that two hundred weeks will be a hundred times better than a couple of weeks—or even as wonderful. And if one day, next year or next decade, I should happen to return to Chile, the time to be had will probably not be as much fun; it will only be different. 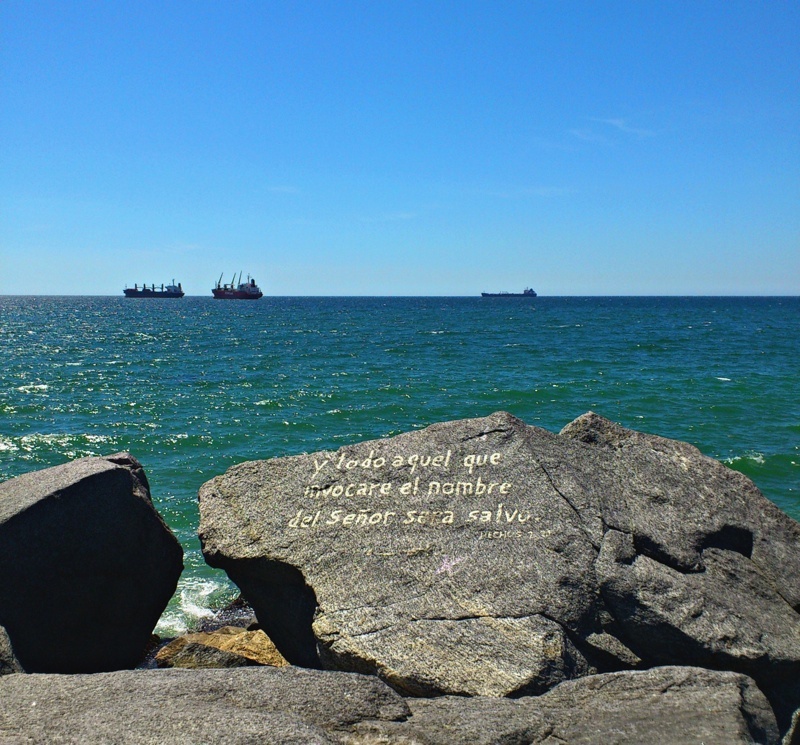 A rock on the shores of Viña del Mar, a Chilean coastal city northwest of Santiago, bears a Biblical passage: "And whoever calls upon the name of the Lord shall be saved." The drive to Santiago International Airport from the city’s center goes through Costanera Norte, a smooth expressway that runs along the northern bank of the Mapocho River. It is the same first major road that you take to get to Casablanca Valley and Viña del Mar, but you make a right before Ruta 68 and exit via Vespucio Norte Express. It’s not a long drive. It seemed even shorter on the Wednesday afternoon that K took me there. We said goodbye to each other at one of the entrance doors. It was actually scorching hot, but I still wore my coat: some pathetic defense mechanism, surely. I put sunglasses on, and so did he. “Don’t do anything I wouldn’t do,” he said. It was kind of his catchphrase, I’d learned early on. I forced a laugh and gave him a hug—a hurriedly performed, deliberately anti-dramatic act of farewell. K was right: it felt like dying. “Thanks for the memories,” I said. Then I watched him walk away, back toward the Chevy, and when I could no longer see him I turned around, stepped through the door, and prepared for my long journey to the southeast. Migs Bassig, 28, has returned to Manila after living and working as a writer in Santiago, Chile. You can follow his blog at http://migsbassig.blogspot.com/.